I tend to associate my friends and family with a recipe they have once cooked for me. One friend is forever tied to an amazing layered ice cream cake she made for a party. Another will never escape the delicious chunky spaghetti sauce she made one night we came over. My mom will always be connected to London broil with Secret Sauce. A recipe she figured out after weeks of spying on the chef cooking at a restaurant where she waitressed. Peanut butter cookies will always belong with my dad. He would bake up a batch of cookies when my sister and I visited on the weekends. Dad’s peanut butter cookies were soft, dense and chewy. Cookies that would stand up to a good dunk in his coffee while reading the Sports section of the LA Times. These are not those cookies. His recipe was one of those lost to me when he died and it is one of the reasons behind starting this food blog. I have tried at least four different peanut butter cookie recipes without finding one that comes close. This recipe is the result of my most recent effort. These cookies are nothing like my dad’s instead they are light, fluffy and moist like little peanut butter rain clouds. 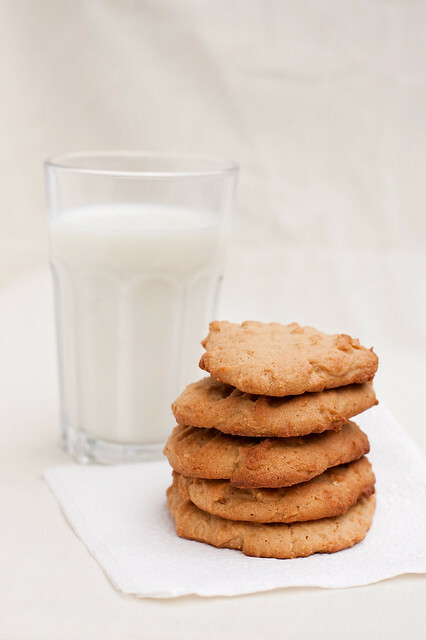 They taste like a completely different cookie and are just as yummy dunked in milk. 2. Stir together flour, baking soda and baking powder in a med bowl. 3. In a large bowl, combine butter, peanut butter, sugar and honey until mixture is creamy. 4. Stir in egg and vanilla until you can’t see any more egg. 5. Stir in the flour mix in three parts to avoid getting it everywhere while you stir. Mix it in until just combined. 6. Spoon 1 inch balls about 2 inches apart on parchment lined baking sheets. You could also just use un-greased baking sheets. Flatten balls with the tines of a fork in a crisscross pattern and sprinkle with sugar. Bake for 8-10 minutes until lightly golden on top. Enjoy with a large glass of milk or cup of coffee. 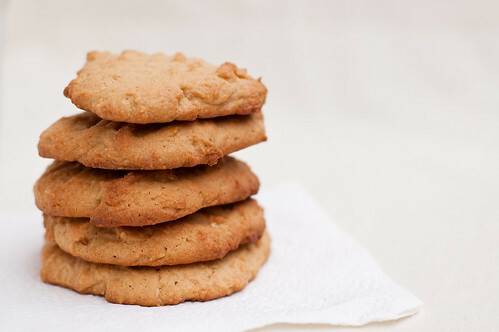 Do you know of any dense, chewy, peanut butter cookie recipes? I would love to find one! I think I would most definitely enjoy eating a peanut butter cloud, so I’m up for trying these. 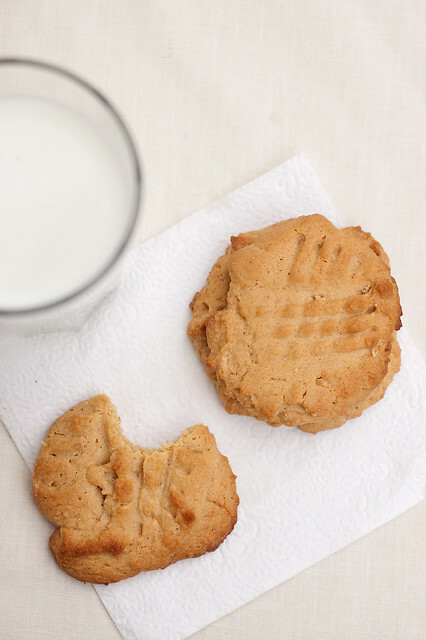 Also, my mom makes a rather chewy peanut butter cookie, so if I can snag her recipe, I will post and let you know! Fall makes me get into baking mode so it is highly likely I will make some pbcookies soon. Thank you! !